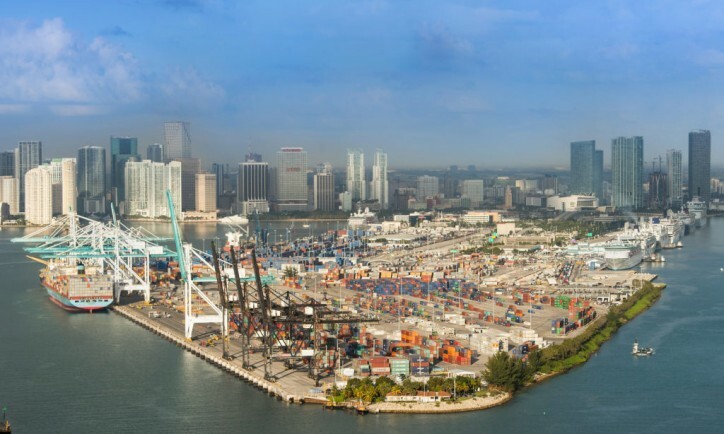 PortMiami is among the nation’s busiest ports contributing approximately $43 billion and more than 334,000 jobs annually to the South Florida economy. Its sustained performance propels Miami to be recognized as the Cruise Capital of the World and Global Gateway for containerized cargo. After completing more than $1 billion of capital improvements on the cargo side, including a deep water channel with a depth of -50/52 feet, the acquisition of new super Post-Panamax gantry cranes, upgrades to on-dock intermodal rail providing connectivity to 70% of U.S. population in less than four, and a fast access tunnel link to the U.S. interstate highway system, the world’s largest container shipping alliances have made PortMiami their preferred port solidifying its position as a world-class global gateway. To date, the Port has welcomed more than 250 Post-Panamax vessels requiring a -39 ft. draft or deeper that could not have called without the completion of these projects. Last year the Cruise Capital of the World set another world record in cruise passenger traffic with nearly 5.4 million vacationers sailing through PortMiami. And recently, the Port launched a new modern cruise era making renovations and improvements including options for new cruise berths, terminals, and parking facilities expanding its footprint for the next generation of cruise ships. Royal Caribbean Cruises Ltd. officially opened Terminal A, the largest cruise terminal in the U.S., in collaboration with Miami-Dade County. The new terminal at PortMiami will serve as homeport to some of Royal Caribbean’s largest ships. Another major enhancement is Norwegian Cruise Line’s Cruise Terminal B, the Pearl of Miami, currently under construction and scheduled to open February 2020. MSC Cruises new cruise terminal — or two —is in the works. A letter of intent was just signed last week that would bring an estimated 1.5 million passengers through PortMiami each year. MSC Cruises currently operates a fleet of 15 cruise vessels. Three of them call Terminal F at PortMiami home: MSC Seaside, MSC Divina and MSC Armonia. An MOU with Disney Cruise Line to expand with two cruise ships and a possible new cruise terminal was approved by Miami-Dade County Commissioners last year. Additionally, Virgin Voyages has also proposed building a 100,000 square-foot terminal in 2021 for its new cruise ships, the Scarlet Lady and another unnamed ship. PortMiami is moving in many exciting directions. It’s full speed ahead charting a strong and steady course, looking forward to a new era of growth and prosperity for both the cruise and cargo sides of our industry.